Great wine is made in the vineyard, and it all starts with terroir. Our exceptional terroir is the closest comparable in Australia to Burgundy & Champagne in France. In the 90’s we began an exhaustive search for the right ‘terroir’ to produce wines like those produced by our extended family and ancestors in Burgundy. Much is written about the qualitative aspects of terroir – the culture, knowledge and techniques used at a specific vineyard location. Some of these are understandable when you speak with French vignerons who have hundreds of years of growing notes covering most seasons they will experience. However, we set our sights on more quantitative measures that define the great regions of France and in particular, the great vineyards of Burgundy, upon which we could develop our own cultural aspects of terroir. The key factors are soil, climate and location, all of which are inter-related. Burgundy is nearly 400 kilometres from either the Mediterranean, Atlantic or Channel. Its best vineyards lie on shallow (mid-slope) sandy-loam soils that have been enriched with limestone making them mildly alkaline (pH 7.5 to 8). With these parameters in mind, we conducted an extensive search encompassing much of the major wine regions of South East Australia. However, we decided to pioneer a new area, just outside a picturesque little country town of Rylstone. Located 40 kilometres south east of Mudgee (and nominally within Mudgee’s Geographic Identification zone, but with vastly different climate and soil type), our vineyard has what we believe are unique conditions for Australia. 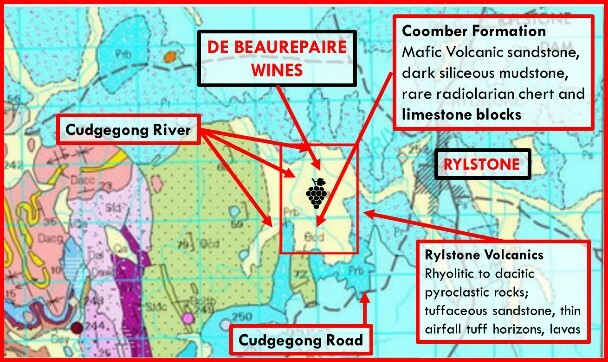 Conditions which make it arguably the closest ‘terroir’ in Australia to Burgundy. The formation story of our terroir commenced approximately 400 million years ago during the Emsian era (Devonian period), a time when the seas were rich with ammonoid molluscs (shellfish). At this time, Australia was the most eastern portion of Gondwana and rested across the equator with warm coastal waters, coral reefs and bountiful sealife. Over the next 400 million years, the shellfish which inhabited these reefs and coastlines were compressed into very high-grade limestone. Our vineyard resides upon one of these ancient coral reefs. The limestone which extends under our vines used to be mined by the nearby Kandos Cement Works to make the cement which built the Sydney Harbour Bridge. 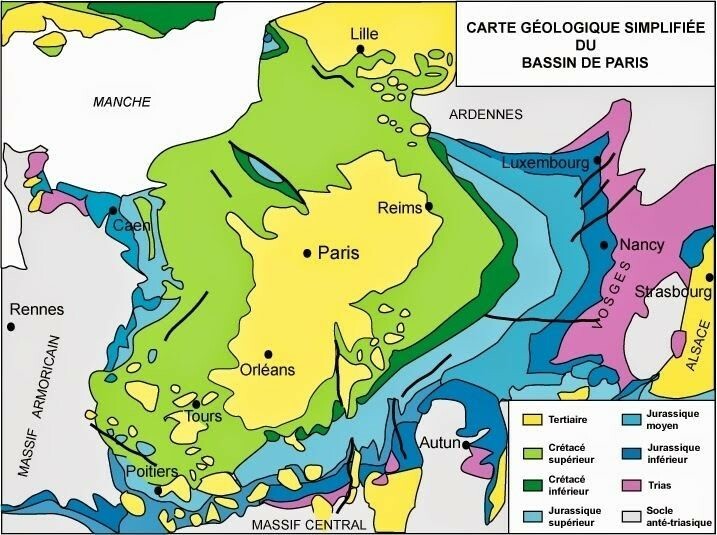 Approximately, 150 million years ago, during the Jurassic period (Mesozoic era), the coastline of France was a long way inland from its current location. Tracing a course stretching from the cliffs of Dover down through Champagne, Burgundy and then roughly across toward what is now the Atlantic Coast through the Loire Valley. 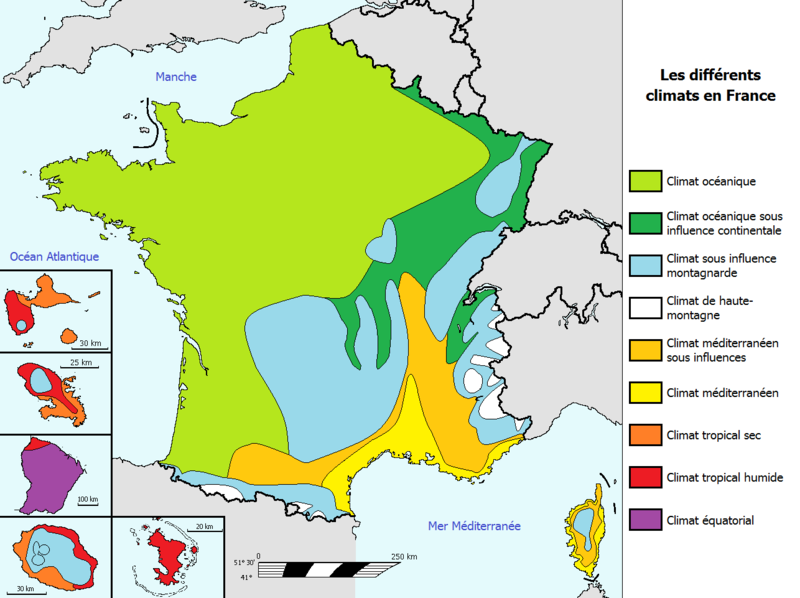 At the same time, the climate of France was closer to current day Miami, producing a coastline teeming with aquatic life around this very shallow sea called the Paris Basin. These shellfish deposited into layers of calcareous sedimentation, which over the millions of years converted into thin, elongated deposits of limestone tracing the shoreline (parts of which are called the Kimmeridgian chain). 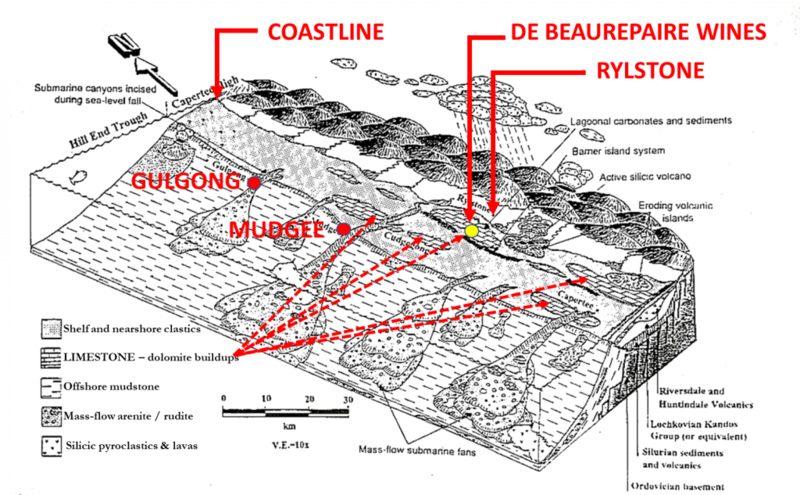 These limestone deposits, driven upwards into scarps by faulting at the time the Alps formed and mixed up with clay and sand into marl, form the basis of the different Burgundian wine regions from Chablis in the far north, through the Côte d’Or (Côte de Nuits, Côte de Beaune) down to Maconais. The vineyards of Burgundy closely hug these narrow soil profiles, hence the Côte d’Or vineyard plantings are 65 kilometres long by only 1.5 kilometres wide, rather than covering much of Burgundy where there is no limestone in the soil. The different geological structures of the Rylstone region are most evident by the volcanic rock (Rylstone Volcanics) overlaying much of the limestone (Coomber formation) which appear in isolated locations where the lava flows ceased, or the volcanic rock has been eroded. Due to the hardness of the volcanic rock, it tends to form the highpoints around the area. The boundaries of the two rock types are very clearly defined. Our vineyard closely hugs the limestone formation and abruptly stops wherever the soils turned to volcanic rock. The driveway down into the vineyard has volcanic soils on the right which have been left as pasture, and limestone infused soils on the left which have been planted with vines. Volcanic rock is incredibly hard and acidic, making fracturing for root growth difficult and the acidity makes the soils less efficient, meaning they require higher organic matter content to produce the same mineral availability for the vines. It is for this reason that limestone infused soils with their high pH (and mild alkalinity) can be vastly shallower. In fact, some of the best vineyard soil in France can be as shallow as 30cm in the Côte de Blancs in Champange (where many of the best Blanc de Blancs Champagnes are found), or less than 50cm on the Grand Cru midslopes of Burgundy. Cistercian and Cluniac monks figured out that different soil types and locations could dramatically influence a wine’s character. They subsequently divided vineyards into some 1,200 patches surrounded by rock walls, known as “clos”. Variations in soil are broadly categorised as physical and chemical. 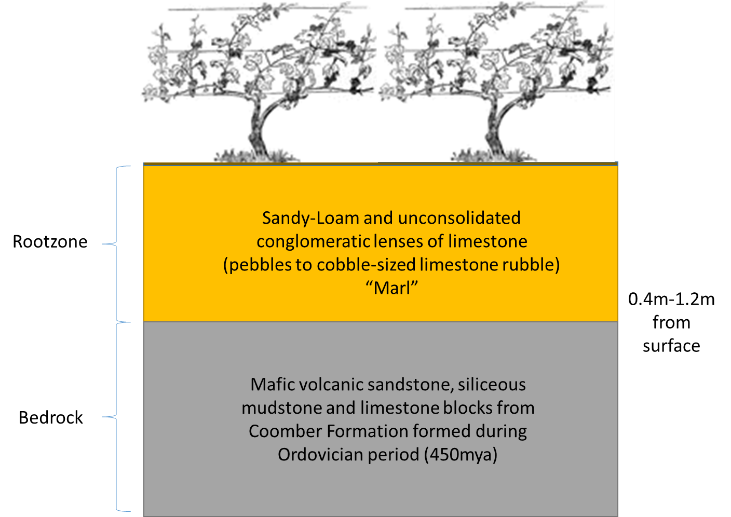 Physical differences in soils such as depth, layering, consistency, water retention, coarseness and structure all impact on the growth habit and resultant fruit of the vine. Chemical differences are perhaps more subtle, and include acidity (and alkalinity), macronutrient availability, micronutrient availability, chelation and soils microflora. These two elements are deeply interconnected and manifest as an endless variety of nuance and variation in grape, must and wine flavours. The best vineyards in Burgundy (e.g. Romanee-Conti) are situated on the mid-slope where erosion keeps the soil relatively shallow, but there is more top soil than the higher slope areas where erosion exposes the limestone in spots. Our vineyard soils are relatively shallow, ranging from less than 40cm to over a metre depending on the pooling of soil from erosion (Colluvium/Slope Wash). There is much variance, as to be expected from a 53-hectare vineyard which covers rolling hills and then up a slope, but the result can be very shallow root zones and, depending on the exact soil composition, very good drainage reducing the availability of water. This reduces vine vigour and can increase grape colour and flavour intensity. With experience, we have gradually reshaped parts of our vineyard to their most appropriate varieties. Our Cabernet is planted on the deepest soils, which they love, where slope wash has pooled over the millenia. Whereas our Chardonnay is planted on the shallowest soils in the vineyard. We are 500 years behind Burgundy where the Cistercian and Cluniac monks figured out all the soil types beneath much of vineyard from centuries of meticulous record keeping, but with the help of science, we are hopeful that we may get a handle on it within 50 years. Climate is the final piece of the terroir puzzle. It is an important piece, but less so than soil and geology, as there are many valleys in Burgundy sharing the same temperature and inland location, but only one Côte d’Or. Climate drives elements of the vine’s growth and grape ripening which are largely determined by Sunshine, Aspect, Heat Summation, Rainfall, Humidity, Wind and Diurnal patterns (daily temperature variation). Every vineyard location in the world is unique and on a micro-climate level there can be great variations – we have watched storms cross parts of the vineyard soaking them and leaving other areas dry, and we also have areas where cold air pools and where there is higher exposure to wind. Starting at the top, there are two major climate types – continental and maritime. Maritime climates are well regulated by the ocean and experience very minor changes in temperature, regardless of location and season. 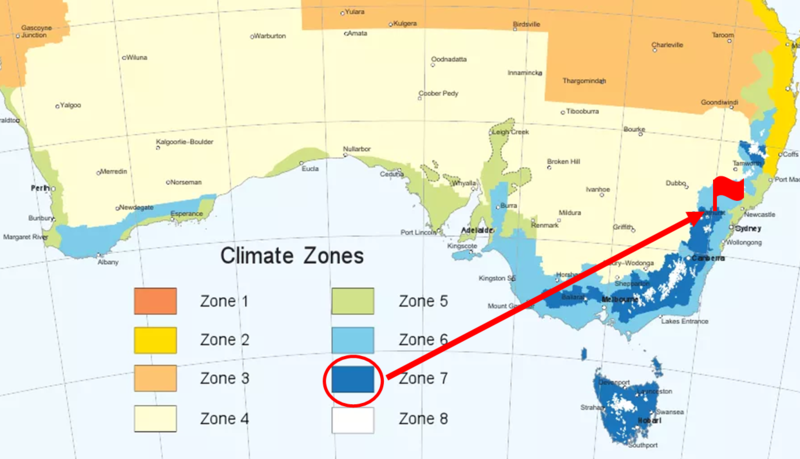 Continental climates are inland and lack the temperature regulation, producing wild swings in daily temperature. 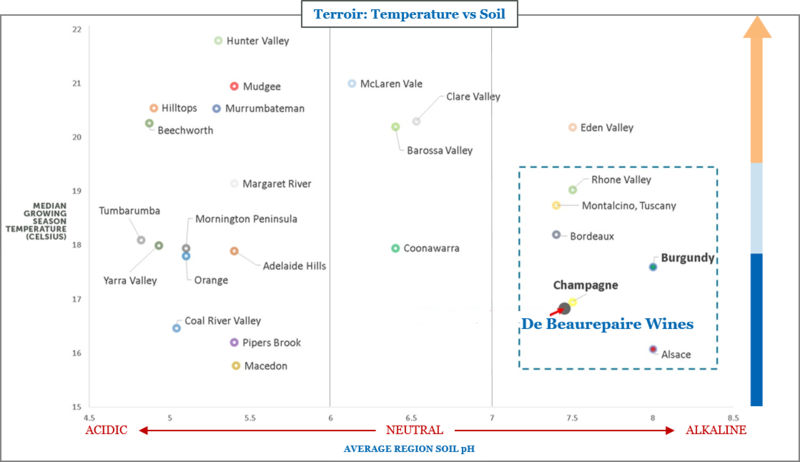 In terms of viticulture, large daily temperature ranges (diurnal variation) is a major source of stress for vines. Much like any living organism, moving quickly from cold to hot, or even cool to warm, results in a response – in humans we put on and take off clothing layers. In grape vines, the stress makes them look to protect their offspring, their seeds, and in turn results in a thickening of the grape skins. Grape skins are where most of what we call ‘terroir’ is expressed. A good example of their importance is the difference between a red wine and a rosé wine and the use of skins in winemaking. Chardonnay and Pinot Noir are naturally very thin skinned varieties. This means that when grown in climate with large diurnal variation, i.e. continental, the skins thicken which can produce increased structure and intensity. It is for this reason that Burgundy and Champagne, with their continental climates, focus on Pinot Noir and Chardonnay; whereas Bordeaux with its maritime climate grows thicker skinned varieties like Cabernet Sauvignon and Merlot, and not the other way around. Rylstone is located on the western edge of the Great Dividing Range, ~160 kilometres from the coast. The natural wind direction is also from the west, i.e. further inland. Temperatures can easily change 25 to 30 degrees in a day and the dry inland winds reduce humidity, and therefore some disease risk. We produce Burgundian/Champagne varieties and Bordeaux and Rhône Valley varieties. This was driven by our need to sell a large portion of our grape production to other wineries to provide cashflow to fund our own winemaking operations; and in the 1990s, there was a heavy focus on Bordeaux varieties (Cabernet Sauvignon, Merlot, Semillon) and Rhône varieties (Shiraz) across Australia – so we planted what was in demand. The net result has been some wonderful discoveries. With beautiful, textural and perfumed Cabernets; and smooth, long Shiraz pointing to the use of continental and maritime as a guide rather than a rule book for vineyard site and grape variety selection. The altitude of our vineyard (600 to 650 metres) produces a very cool climate, accentuated by the sandy-loam on limestone soil structure which retains very little heat. The result is a climate that can be cooler than higher nearby regions with their volcanic soil base, as rocks can retain heat through the night. Once the sun sets, all the day’s heat is quickly lost – and produces a vintage which is arguably one of the last on Mainland Australia, and more in line with Tasmania and Central Otago New Zealand. A later vintage means longer and slower grape ripening, which can result in better grape acid and sugar balance at harvest. 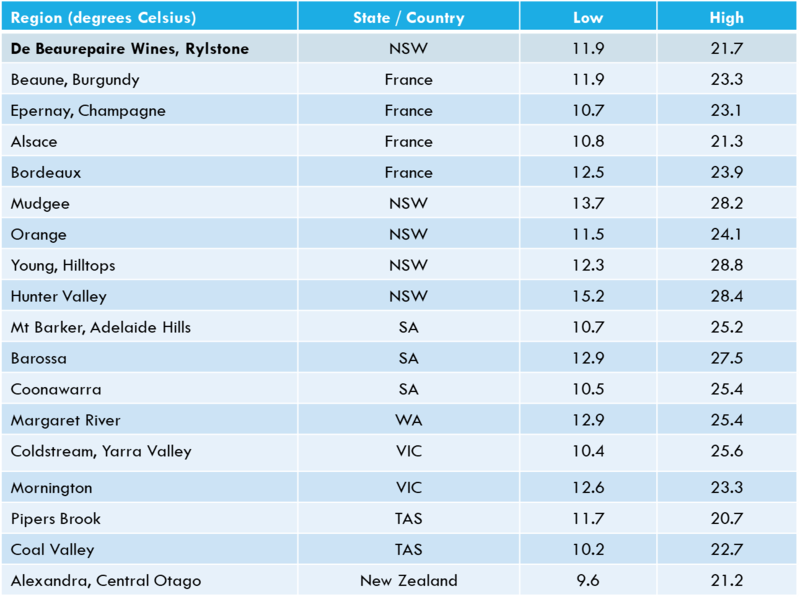 Critically for us, the growing season temperatures of Rylstone are on average very close to Champagne and Burgundy. Terroir chart: The points reflect the averages for each region, based on published sources. Individual wineries may differ from the average on either scale.